Investigating exoplanet atmospheres can provide new insight into how and where planets form around a star.“We need to look outward to help us understand our own Solar System,” explains lead investigator Hannah Wakeford from the University of Exeter in the UK and the Space Telescope Science Institute in the USA. Therefore the British-American team combined the capabilities of the NASA/ESA Hubble Space Telescope with those of other ground- and space-based telescopes for a detailed study of the exoplanet WASP-39b. They have produced the most complete spectrum of an exoplanet’s atmosphere possible with present-day technology. By dissecting starlight filtering through the planet’s atmosphere the team found clear evidence for atmospheric water vapour. 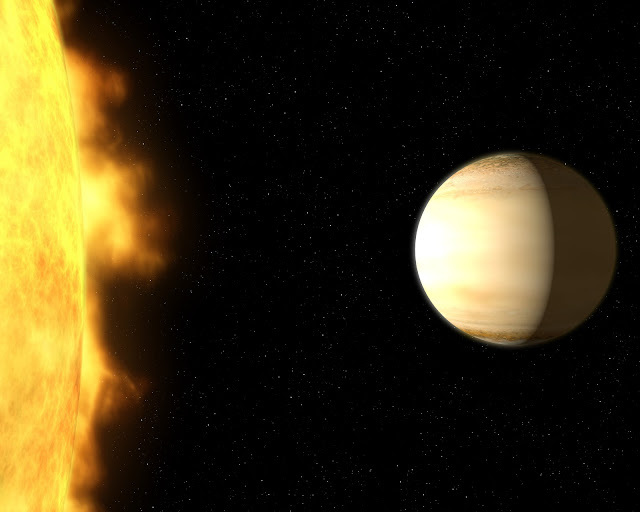 In fact, WASP-39b has three times as much water as Saturn does. Although the researchers had predicted they would see water vapour, they were surprised by the amount that they found. This surprise allowed to infer the presence of large amount of heavier elements in the atmosphere. This in turn suggests that the planet was bombarded by a lot of icy material which gathered in its atmosphere. This kind of bombardment would only be possible if WASP-39b formed much further away from its host star than it is right now. “Hopefully this diversity we see in exoplanets will help us figure out all the different ways a planet can form and evolve,”explains David Sing.